The Mediterranean Youth Employability Day in Marseille at the Villa Méditerrannée on 14 April is part of the New Chance Mediterranean (MedNC) programme, and the aim was to hear from young people. Young programme beneficiaries and the companies that host them talked about their day-to-day experiences and the specific progress they have been able to make thanks to the MedNC cooperation programme, whose goal is to encourage youth access to employment in the Mediterranean. 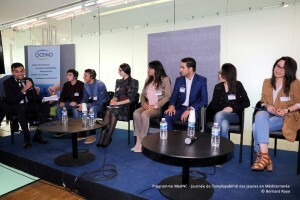 After meetings in Casablanca, Tunis, Rabat and Barcelona, the Network organised a “Mediterranean Youth Employability Day” in Marseille on 14 April at the Villa Méditerranée. The event was jointly organised by OCEMO, the Second Chance School in Marseille (E2C), the French Development Agency (AFD), and the Provence-Alpes-Côte d’Azur region, with the support of the Union for the Mediterranean (UfM). It was hosted by AViTeM “For this event, we wanted to hear from the people with most to gain from MedNC – young people”, says Anis Saïdi, MedNC Project Manager at OCEMO. “They talked in very concrete terms about what MedNC has done for them. There was also a very interesting debate between young leaders from Southern and Northern Mediterranean countries.” In the afternoon, experts, well-known figures, participating companies and public policymakers shared their underst anding and perspectives during two panel discussion sessions on the following themes: “Public policies to boost youth employability” and “Youth employability and Corporate Social Responsibility”. The MedNC Network steering committee meeting was held the following day, 15 April at E2C in Marseille. The various Network partners, representatives of the eight Mediterranean countries, met for a day of work. “The solutions for Northern Mediterranean countries are not the same as those for Southern Mediterranean countries, but success stories from across the region offer a source of inspiration and encouragement for all parties. We hope that this conference will mark an important stage in our project and collaboration, by reinforcing the capacity of public and business world decision-makers to make the most of young people and the advantages of cooperation,” concludes Pierre Massis. The MedNC programme is coordinated by OCEMO, in partnership with the Second Chance School (E2C) in Marseille and accredited by the Union for the Mediterranean. It is supported by the Provence-Alpes-Côte d’Azur region and the French Development Agency (AFD), and seeks to develop a network of employability initiatives, with a view to helping young people across the Mediterranean access the job market. MedNC is designed as a transnational platform for sharing know-how and discussing innovative methods, bringing together public and private partners and civil society representatives from both sides of the Mediterranean with the goal of restoring pride and dignity to excluded young people. Given the specific features of each initiative, the network works in a complementary fashion by organising itself into three geographical fields: Europe, Maghreb and Mashreq. MedNC is currently working in six countries – Morocco, Tunisia, Algeria, Egypt, France and Spain. Italy and Cyprus are both now showing interest.